Cooking eggs on a griddle is all in the wrist. Functionally, the only difference in a griddle and a frying pan is the anchored cooking surface. To compensate for the unmovable cooking surface, you have to have a little finesse in your wrist, especially when cooking over-easy eggs. A large offset spatula will prove useful when you cook eggs on a griddle. Use a thin-profile metal spatula if you have a cast-iron griddle, and a silicone spatula for electric griddles with nonstick surfaces. Crack each egg in a cup. Crack the eggs on their broad side on the work surface so chips of shell won't get in the egg white. Set the cast-iron griddle on the stove and adjust the burner to medium-low. If you have an electric griddle, lightly oil the cooking surface and set it to 325 degrees Fahrenheit. Pour each egg from the cup onto the griddle surface. Season the eggs with kosher salt and freshly ground black pepper. Pour a small spoonful of water on the griddle and let it bubble for a second. Cover the eggs with a lid. Cook the eggs covered for 1 minute then uncover. Continue cooking until the whites set, about 30 seconds. Slide the offset spatula under the eggs and lift them from the pan. Pry up a corner of the eggs if you need to so you can slide the spatula under them cleanly. Heat the cast-iron griddle over medium heat or an oiled or buttered electric griddle to 325 F.
Whisk the eggs together with about 1 tablespoon of dairy for each and season to taste. Although milk or cream is commonly used, a little sour cream, cultured buttermilk or yogurt not only works, but adds a bit of agreeable tartness that contrasts the fatty yolk. Break off little pieces of cold butter and whisk them in the eggs. The butter pieces lubricate the curds and make the eggs fluffier. You can also add a pinch of baking soda for extra fluffiness if you like. Pour the eggs onto the griddle. Gently slide the bottom of the offset spatula over the top of the eggs in a circular motion for about 1 minute. Turn the spatula over and rake the eggs toward you to turn them over. Turn the heat off on the griddle and let the eggs cook with residual heat until they reach the desired firmness. The eggs will reach full firmness if you leave them on the griddle for 30 seconds after you turn it off; they will be at their softest if you remove them as soon as you turn the griddle off. Crack each egg in a cup. Place a well-oiled cast-iron griddle over medium heat on the stove or set a well-oiled electric griddle to 325 F.
Pour the egg from the cup onto the griddle. Cook the egg until the white sets and turns opaque, about 1 minute. Slide the left side of the spatula under the right side of the egg if you're right-handed; if you're left-handed, slide the right side of the spatula under the left side. You're not sliding the front of the spatula under the egg like you normally would; you're sliding the entire left or right side of the spatula under the egg. Roll your wrist over when you get the spatula under the egg. Don't lift the egg and drop back on the griddle upside down to turn it; you'll break the yolk every time. Simply roll the spatula over smoothly and fluidly with egg on top of it. Cook the egg for about 15 seconds after you turn it for over-easy; cook the egg for 30 seconds for over-medium; cook the egg for 1 minute after you turn it for over-hard. 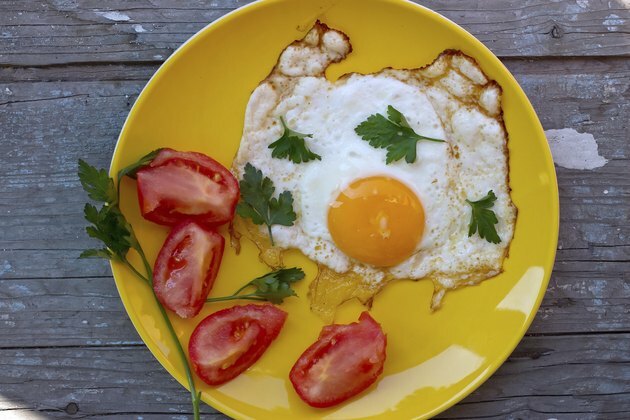 Use frying rings if you want to give the eggs a clean, round shape. Place a frying ring on the griddle, pour the egg into it and remove the ring after 30 seconds.